An Edge-lit system is one in which there are LEDs along at least one edge of some type of light guide. The light from the LEDs will enter the light guide and is typically pulled out by some sort of extraction technology. This light guide can vary in material, thickness, and overall shape and size. Direct-lit systems are straightforward in that they use arrays of LEDs that are directed outward to light the system. These types of systems are more efficient since the light doesn’t have to work as hard or interact with as many surfaces to get out of the system. However, direct-lit systems cannot achieve the directionality of light that edge-lit systems are capable of. There are many means to enhance any type of lighting system, including implementing lenses, reflector cups, TIR optics, and various reflectors and diffusers. These can help your system become more efficient, change the output distribution and directionality from the system, and can also help to achieve different visual appearances. There are many different types of optical lenses available, but overall its purpose is to either diverge or converge light. 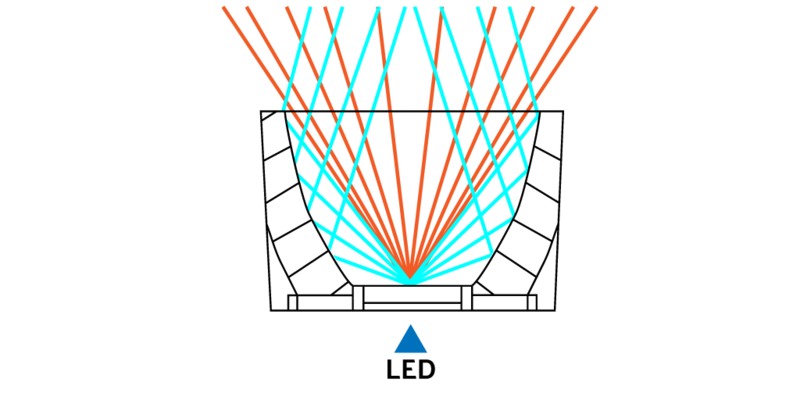 A convex lens will converge, or gather, light from a source to a focal point, which can be varied depending on the curve and geometry of the lens. 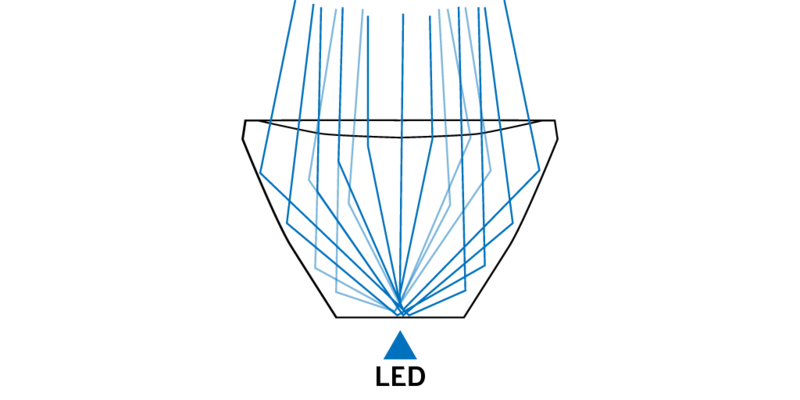 A concave lens will diverge, or spread, light from a source at different angles depending on the location of the focal point. 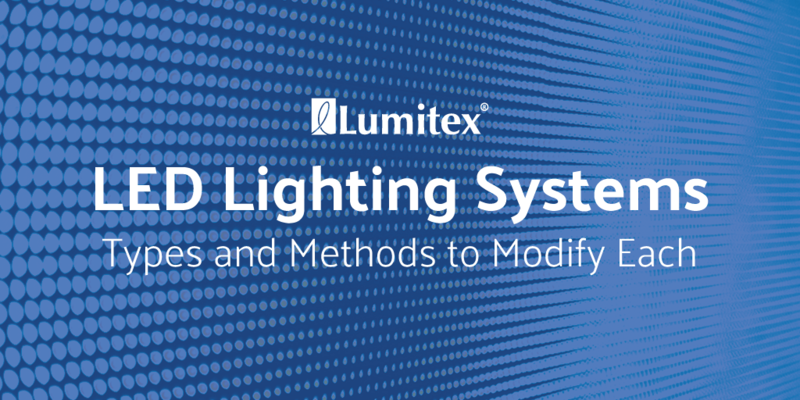 Lenses in an Edge-lit system can help to increase the efficiency of your lighting system by enhancing the coupling of light into the light guide from the source. The types of lenses that would help achieve this include ball, convex, and aspheric lenses. Lenses in a Direct-lit system can change the output distribution of light, spread or condense the light output. The types of lenses that would achieve this include convex, aspheric, concave, and micro-secondary lens. Reflector cups sit over the LED in order to alter the beam of light. They can come in many different curves and geometries depending on which lighting effect or distribution is to be achieved. While reflector cups typically don’t offer as much control as a lens would, they are an affordable and simple addition to your system. Reflector cups can increase the efficiency of your lighting system by enhancing the coupling of light from the source. They can reduce losses by redirecting the high angle light from the LEDs that would typically be lost into and through the light guide and system. In a Direct-lit system, reflector cups can change the output distribution of light. By changing the curves and shapes of the reflector, the angle the light is exiting the system will be affected. Reflector cups enhance visual appearance. (when visible they can change with surface finish and material of the reflector being used). TIR optics are secondary optics that make use of total internal reflection in order to redirect light from an LED source. The optic sits on top of the LED so that it can collect as much light as possible emitting from the source. It then uses different curves and geometries to redirect and collimate the light. These lenses can come in a variety of sizes and geometries depending on the desired result. They can also be designed to use with single, multiple, or even strips of LEDs. TIR optics in Edge-lit systems can increase the efficiency of your lighting system by enhancing the coupling of light from the source. It redirects light that would typically be lost in the system. It reduces losses and puts stray light into and through the system. It also collects stray light from the high angle of the LED. TIR Optics can change the output distribution of light. It can vary geometry to affect the direction the light is exiting the system. TIR optics perform better than reflector cups because they can gather much more of the light and therefore further control the output directionality. TIR optics can enhance visual appearance. They can alter both the lit and unlit appearance depending on the type of lens used. Some optics can have different surface properties in order to adjust the output of light. To further explore TIR optics vs reflector cups in a direct-lit system visit this article from LED Magazine. Reflectors are very common in Edge-lit systems. They are used to direct light that would normally come out of the closed face of the light guide back into the system and out of the open face. Reflectors can come in many different forms including films, tapes, or metal. They can be formed or cut to any desired size. There are many different finishes that will provide different results. Specular reflectors will have a mirror like finish and the angle of reflectance will equal the angle of the incoming ray of light. Diffuse reflectors will scatter the incoming light ray in all directions and will create a lambertian output. These diffusers are typically white and can also be replicated with matte white paints or powder coatings. Semi-diffuse reflectors can lie anywhere between specular and diffuse outputs. They will save some directionality, but also scatter the lambertian beam depending on the reflectivity of the surface. 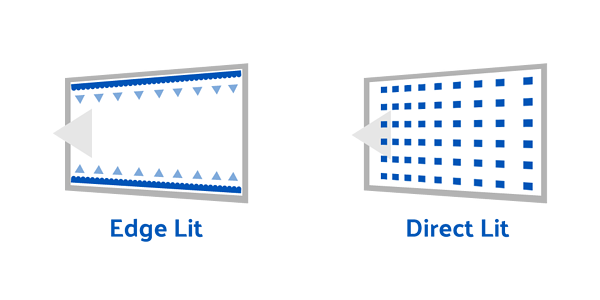 Reflectors in Edge-lit systems can increase efficiency by redirecting light that could be lost in the system back to the light guide and out of the system. Efficiency will change depending on the type and quality of the reflector. In an Edge-lit system, the light in the system will interact with a decent surface area of the reflector. Depending on the type of reflector (specular, semi-diffuse, or diffuse), different output distributions can be achieved. A specular reflector will have sharp distributions with strong cutoffs. A diffuse reflector will create a more lambertian distribution. And a semi-diffuse reflector will produce something in between the two. Reflectors will alter the appearance, both lit and unlit. Unlit you will see the reflector though the light guide. When the system is lit, the appearance will vary depending on which reflector is used. A specular reflector can cause certain types of extraction features to look “shiny”. It can also allow you to see individual points of reflection in the system. A diffuse reflector will help make the light guide look smoother and uniform. It will help blend the extraction features together to give off a softer and visually comforting look. Reflective surfaces in Direct-lit systems can help increase efficiency. The more reflective surfaces that the light will touch, the less light will be absorbed and ultimately lost as it travels through the system. The reflective surfaces can help alter the output distribution depending on the surface finish, however, in many Direct-lit systems the light will not interact with as much surface area so the contribution will be less. The visual appearance can also be affected by the type of reflector used in the system both lit and unlit. 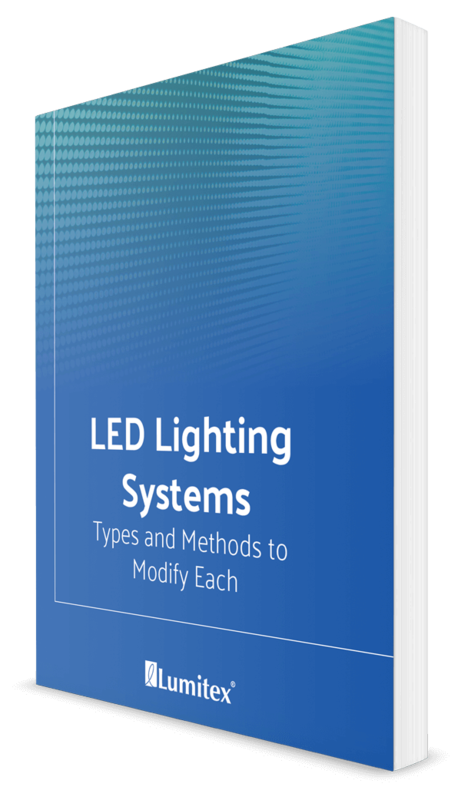 There are many different types of films that can help to modify a lighting system. One of the most common films is a diffuser. Diffusers can come in different forms such as sheets, tapes, and panels. They can also vary in thickness and light transmissivity. They are used to spread light and make the system more diffuse and even out illumination profiles. When using diffusers, it is important to keep in mind that the more diffuse of a film you use, the better the visual appearance, but the worse the efficiency. Diffusers in Edge-lit systems add another layer for the light to interact with and will cause the efficiency to decrease. The more diffuse this layer is, the less light can get through causing the overall efficiency of the system to decrease. Adding a diffuser will change the directionality of the system and cause a more lambertian output. There are some diffusers that can shape the output distribution in different angles. Diffusers can help to hide hot spotting from LEDs by spreading the light and making it look more uniform. This also helps to hide defects or inconsistencies that can be on the light guide. Diffusers will produce a softer looking light when lit. When the system isn’t turned on, it will look the color of the diffuser, typically a milky white aesthetic. Diffusers in Direct-lit systems will also decrease the efficiency. The same rule applies as in Edge-lit systems: the higher the diffusion, the lower the efficiency. 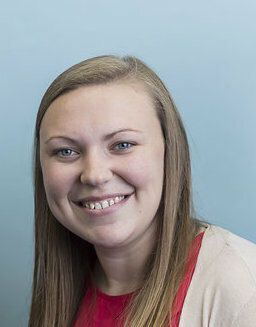 When implementing a diffuser in a Direct-lit system, there will not be an overwhelming effect. Light shaping diffusers can help to create slightly different outputs and cutoffs, but since LEDs already emit a lambertian distribution, there will not be any drastic changes. Diffuser films can help to hide the LED light sources as they can blend the light together to look more uniform. They produce a softer looking light when lit. When the system is not lit, rather than seeing direct LEDs, the viewer will see the diffuser, which can be much more visually appealing. The high efficiency and directional nature of LEDS makes them appropriate for many uses. Modifying light in LED lighting systems will increase efficiency, enhance brightness and can alter visual aesthetics. Lumitex is inspired to help with your innovative lighting solutions that will adapt to your idea. We have lighting solutions that provide just the right light for any of your projects.